The Hakone Art Museum has the distinction of being outdoors, exhibiting his works in a flag, but mainly in the large gardens in it. It is located in Gora and was doubted by Okada Mokichi in 1952. Since then it is one of the main tourist attractions in the city of Hakone. The collection of the museum is mainly composed by Japanese art, with an emphasis in ceramics from the beginnings of this art until the Edo period (between 1600 to 1668). Within the magnificent pieces on display, find great works like clay pots with centuries of history or large funerary statues. 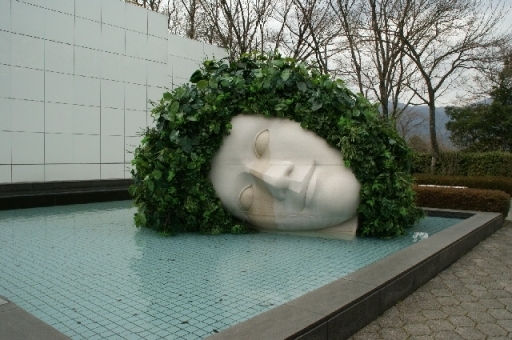 Also find more than 100 masterpieces of modern art scattered in 70,000 square meters of green areas. Represented artists such as George Rickey, Rodin, Bourdelle, Miro, Francisco Zuniga. There is also a collection of pieces by Henry Moore to form part of the artistic merits of the millionaire Nelson Rockefeller, and it was donated by him to Japan as a symbol of peace. One of the most valued collections of the Hakone Art Museum is the ceramic works of Picasso. More than 300 pieces are displayed in a special unit for this artist. These pieces come mainly from the heritage of Picasso’s eldest daughter, Maya Picasso, supplemented with paintings, sketches and many photographs of the painter in his last years of life in full artistic creation. The Hakone Museum Gardens have great appeal in themselves because by design and botanical wealth, form an exhibition in themselves. They are also a charming scenario that follows the curves of the natural landscape where roads and slabs, rock gardens, bridges, canals, rivers and pavilions in the shade of its trees. Visitors can tour these paths between the various sectors of the garden brilliantly designed guided by natural forms, as only the Japanese can do, and even participate in the tea ceremony served in a small pavilion. It’s simple to get to Hakone Art Museum, located on the slopes as we said Gora, near the Gora Park. The Tozan cable car linking with Souzan Gora, leave you in the Koenkami station, and from there you get walking in 5 minutes following the signs. You can also get from the Gora station, but from here you can have a walk of more than 10 minutes up the mountain slope. Open Friday to Wednesday (closed Thursday) from 9.30 am to 16.30 pm (closes half an hour earlier in winter). And entry fee is 900 yen (about 7.50 euros).